The puerile Dudley Moore comedy from 1981, about a poor little rich boy on a perpetual bender, has been turned into a vehicle for the tight-trousered, impossibly beautiful British comedian Russell Brand. His snotty, improvised quips are good for a few laughs, though three decades of skyrocketing income inequality have soured the comedy of Arthur's astronomically expensive self-indulgences. (They don't seem far removed from things you actually read about now.) 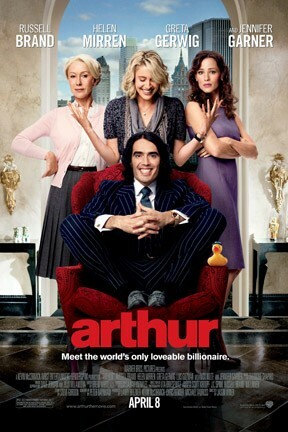 The spoiled heir falls in love with a working-class woman (Greta Gerwig, all legs) and must choose between her and his wealth; as in the original, this conflict turns out to be a tease and Arthur gets to have his cake and eat it too. Improv Olympic alumnus Jason Winer directed; with Jennifer Garner, Luis Guzman, Nick Nolte, and Helen Mirren, inheriting the John Gielgud role as Arthur's long-suffering servant. Arthur and Arthur are not showing in any theaters in the area.